JEDDAH, 11 May 2006 — To fasttrack the promotion of motor sports in the Kingdom, Prince Sultan ibn Fahd, president of General Presidency of Youth Welfare, has issued the first permit for Saudi Arabia’s FIA authorized motor sport venue in the Kingdom. The official approval for Jeddah Raceway, considered as the first and largest project of its kind in Saudi Arabia, came after complying with FIA and Presidency’s rules and regulations according to Abdullah Al-Zamil, president of private clubs at the Presidency of Youth and Welfare. He pointed out that the support of the Saudi government proves their concern to provide such safe sites where youth could practice their hobbies and also their aim to bring more Saudi talent in motoring to represent the country regionally and internationally. United Racing Company Chairman Prince Faisal ibn Saud ibn AbdulMohsen expressed his gratitude to Prince Sultan for permiting Jeddah Raceway to kick off its activities to promote the increasing passion for motor sports among Saudi youth, adding that he hoped the project would also further encourage young Saudis to hone their racing skills in a safer, controlled environment, without jeopardizing road safety. 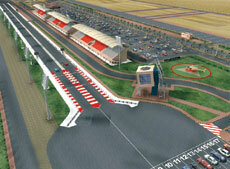 “Jeddah Raceway will be home to some of the best sporting action through a regular calendar of racing activities. It will also enable sports enthusiasts to enjoy a ringside view of the spectacular motor sports experiences,” he pointed out.